Sardines are the principal performers here! 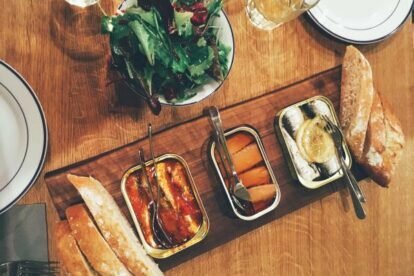 This gourmet bistro in Schöneberg is all about canned fish, which is considered a delicacy in France and Portugal. Needless to say, the canned goods served here have absolutely nothing to do with the supermarket variety. Every single brand is hand-picked by owner Thomas Vetter, who came to love canned fish during his international career as a chef and opened this very special restaurant in 2016. Come here for a casual lunch or a light dinner. The menu can seem quite daunting – so many choices! Apart from sardines there are also variations of tuna, mackerel and others to choose from, plus a selection of wines that go perfectly with them. When I was there I just picked three cans fairly randomly and was very satisfied indeed. The cans are served on a decorative wooden platter together with a small salad and baguette, which is replenished if you ask politely. Most cans cost between eight and twelve Euros. I recommend ordering one to two cans per person to start with and go on exploring the menu as far as your appetite allows!